We've been hard at work the past couple of months and we're now ready to announce another solution Megaventory has to offer - we're happy to announce the integration of our service with Salescast by Lokad! Lokad offers Big Data applications for commerce businesses such as protection from competitor price scraping, phantom inventory removal, out-of-shelf checks and others. Most importantly however, they also offer Salescast, a premium inventory optimization service. Salescast aims at answering two very practical questions every merchant has to tackle on a regular basis about their products: when to order and how much to order of it. All Salescast needs is a list of the items you want answers for and their sales history. Once this is uploaded and processed by Salescast you are informed of an alert/reorder level - i.e. how many items you need to have left in the stock before you make a new order - and how many of those items you need to order. The process is amazingly simple with Megaventory! Whenever you're at the On-Hand Inventory and Alerts screen you can select the products you're interested in and hit the Salescast Analysis button. This automatically sends the data to Salescast where you can login, configure and run the optimization analysis with just a click. The end result is a report which includes the products along with the valuable information of when to order what. The alert levels which have resulted from the smart SalesCast algorithms can then be imported into Megaventory in the usual way through the Data Import module. As already mentioned it's up to the user to select the products and the location they want to run the Salescast analysis for. That way you have maximum flexibility and you can find answers both about specific warehouses for example but also for the business as a whole (useful for calculating future expenses, for example). To summarize, Salescast empowers Megaventory and by extension any serious entrepreneur with a very useful feature for better stock management. What's important here is that this is done not by generating vague reports and getting lost in spreadsheets; instead it all comes down to literally two numbers which are the result of a few mouse clicks. To top all that, this is something both Lokad and Megaventory offer for free! So what more could a business owner ask for? 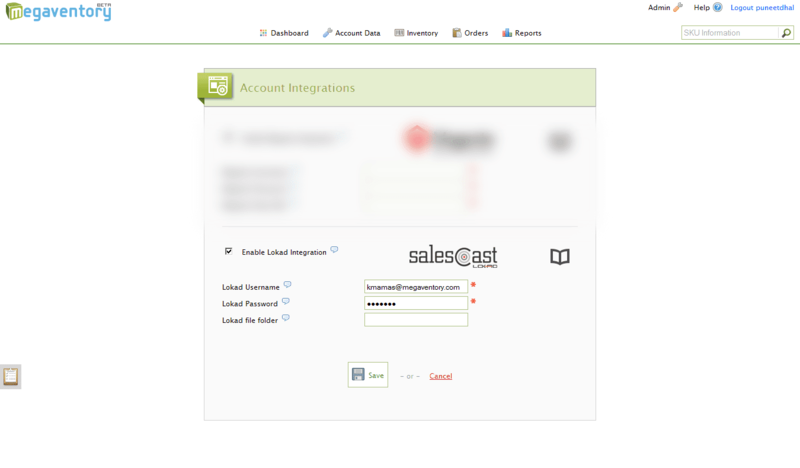 Go ahead - start an account in Megaventory and link it to Salescast. Stay tuned for the announcement of the next integration we've been working on. It's coming soon - can you guess what this is?